The distinctive shape of Parikiore Mountain dominates the skyline north-west of Kamo, in Whangarei. 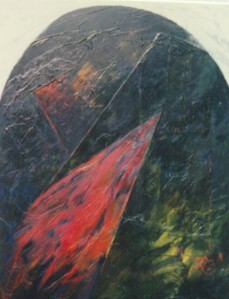 At first my paintings were about the relationship between mass and void. 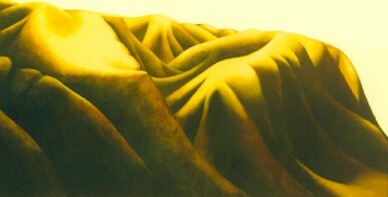 I found by observing the movement of clouds through and around the peaks I could make a positive statement about this. 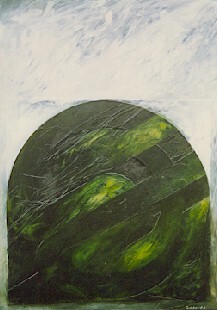 The later paintings were initiated as a visual response to bird songs within the environment of Parikiore and in association with the surrounding landscape - as mass and void, bird and space, earth and song. For me these songs and calls were a comparison that helped me to define the weight and presence of the landforms. I was also captivated by the intricate dance of skylarks, and the way their song imitated their movements. 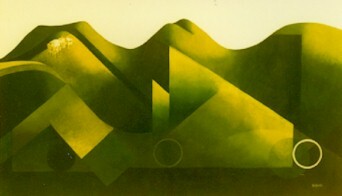 These works developed through the examination of two very different landscapes - Parikiore, a distinctively shaped hill in of volcanic origin in Northland, and the tail end of a range of mountains along the Waitaki river in North Otago. The comparisons are more philosophic than geographic. Just as certain similarities in the landscapes of north and south revealed themselves during the painting process, so too the pictorial relationship between landform and self developed very closely, ultimately revealing something of the true nature of both. 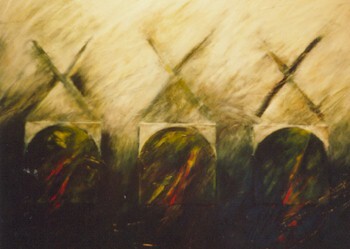 This series were painted mainly in a rented studio at the Northland Craft Trust Quarry after the sale of our home on Parikiore. Being in the company of people with a serious commitment to making art created an atmosphere in which my paintings virtually painted themselves. I was exploring the identity of the three volcanic cones that stretch in a line across the landscape between Maungakaramea and Whangarei. These cones - Maungatapere, Maunu and Hurupaki are striking in their geometric beauty. The red heart of the painting Maungatapere/Lost refers to the volcanic nature of the mountain - hot lava in the earth; and it also symbolises the mountains vitality - its ability to nurture and maintain life. 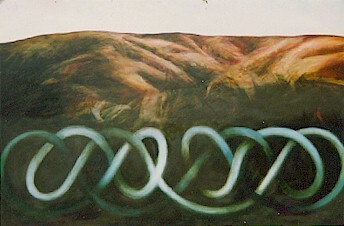 The strong gestural markmaking expressed the violence and power inherent in all of these mountains; the x that developed here in the sky and became stronger in supporting paintings - such as Maunu, Hurupaki and Maungatapere associates itself with denial (crossing out) and love (kisses) - both of which were appropriate in the circumstances. These were my farewell tribute to the Northland landscape. The idea of the sky being a place of messages (light and cloud patterns say the coast is near) developed further in the Ancestors paintings It was easy to extend this idea to build up patterns that relate to more human concerns. The ancestors are many different aspects: first they are the planet and the atmosphere (earth and sky) from which we have evolved. 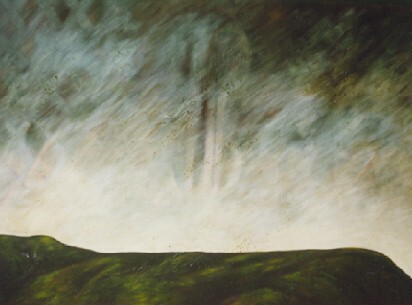 Earth and sky also form the starting point of nearly all my paintings - which also makes them the ancestors of my paintings. The pattern in these skies are a reference to the some of ancestors of art - Renaissance, Maori and Celtic art. Celtic patterns gave me the starting point for my explorations of the elaborate pattern of loops and serpentines across the landscape near Helensville that is the Kaipara River. The river creates an interesting play with the landscape - the land is solid, enduring, permanent. The river moves and changes but remains constant in a wider context. Ultimately, the river changes the land. I couldnt resist the deeper symbolism offered by the river and land: the cycle of water (river - sea/evaporation - sky/clouds - hills/rain - river and through this the cycle of life. This is why in some paintings I made the river from only one line. With no beginning and no end, the circle symbolises both perfection and infinity. The Hearts and Masks paintings explore the human elements of the landscape - the lands influence on the people that inhabit it. 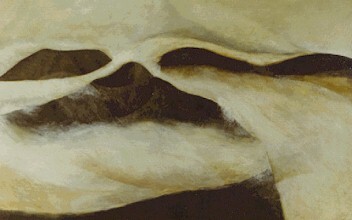 The masks should not evoke any particular personality, but are meant to be representative of humanity. The hearts are made of leaves or fronds but shaped like symbolic human hearts to make a connection of the human relationship with the earth. Manaia, light and spirals allude to spiritual things. 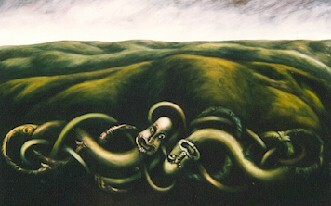 The serpentine shape of manaia and human forms in Maori art from northland echoes the serpentines of the Kaipara river. The smooth undecorated body identifies with the carving of Ngati Whatua, and through this with the Kaipara area. I worked with the manaia rather than human form to make the connection with things spiritual that the continuous line of the Celtic designs in the earlier Kaipara River paintings evoked. This part of the chant calls people together in the search for enlightenment. That our origins, journey and destiny as people is inextricably woven into the land is inescapable. Tuia i te here tangata I links to Te Makuranga - which is also a quest for enlightenment and perfection. The single line of Tuia i te here tangata II has no beginning or end - the circle that represents both perfection and infinity. In Tuia ki runga tuia ki raro the serpentine pattern that weaves the figures together represents, on one level, a binding of two cultures; on another, the line is a circle representing perfection and infinity; and as the river is also a reference to the water and life cycle and the close connection between people and the land. Te Makuranga is a traditional Maori design used mostly on the base board at the front of pataka, but it also may be found as a carved decoration on feather or trinket boxes. The design consists of seven human figures separated by manaia, with a manaia at each end, facing outwards in a protective stance. The presence of manaia in Maori carving indicates a link with spiritual matters. Each human figure represents one of seven states of existence - The six outside figures are wananga (wisdom), oranga (life), ihi (power), mana (sovereignity), wehi (greatness) and ihowai (equality). Collectively they make a state of balance, makuranga, which is represented by the central figure. On reaching this state of balance, a person is ready to make the journey on the spiritual canoe - to continue in the next life. I have made many paintings of Te Makuranga exploring this concept. The human figures have been replaced at times by nikau trees, or spirals, and by the dead keruru - a highly personal symbol for me of the crossing through to the next existence. The spaces between - the paths to reach the state of balance, Te Makuranga - sometimes darkness, indicative of the mysterious nature of our existence in the next life; the slashed canvas or white slashes indicating the ways through to enlightenment; the distant landscape represents Te Ao Marama - literally, the world of light - the realm in which we now exist. The Tukutuku paintings are part of a series I have been working on since 1994, originally as lithographs, in which they are as much about exploring the medium as about imagery. 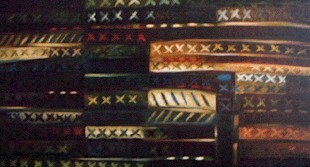 In the whare whaikairo, tukutuku panels are placed in the spaces between the carved wooden ancestor figures. They are made of dark and light strips of natural fibre (flax, pingao) woven in a criss cross pattern. A number of traditional designs are used, eg patiki, a diamond shape representative of flounder; poutama, a right angled pattern representing the stairway to heaven; The triangular pattern kaokoa, human ribs - there are others. I have not as yet attempted to impose this traditional order on my tukutuku work. Several years on, these are still in the exploratory stages, working mostly with composition, colour and medium to remove them to a different plane from the traditional woven panels. 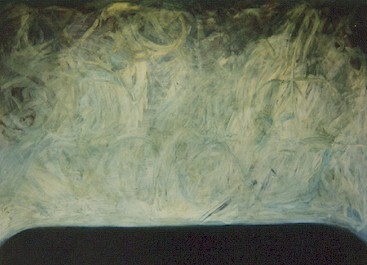 They are less meticulously ordered, in an attempt to express the chaos of life; the fading of different hues and tones, of light to dark is an extension of the light into darkness that has become part of my Te Makuranga paintings, and as such is part of the life-after-death theme, and the role of spirituality in our daily existence. 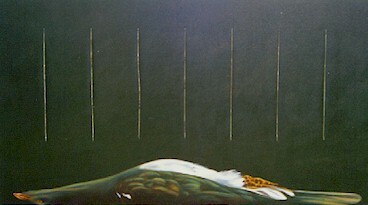 This idea has been very specifically employed in the painting Keruru/tukutuku, where the feather colours of the dead bird have faded completely, to become the colours of the tukutuku - in this painting the tukutuku acts as a vehicle to convey the idea of the spirit of the bird continuing after the demise of its physical body. All the Te Ao Marama paintings relate to life in this world, as compared to the world after death, or before we are born. They have evolved through the process of the Te Makuranga paintings, which were concerned with death and the promise of life after. 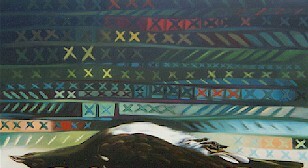 This powhiri (welcoming chant) has been a major starting point in the creation of this series of paintings. This part of the chant calls people together in the search for enlightenment. Te Ao Marama is literally "the world of light" - the realm in which we now exist; but in this chant it is also "the world of enlightenment". 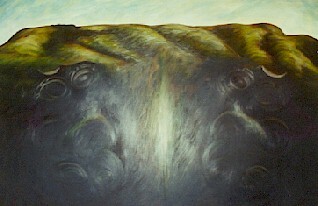 1999 saw the start of a series of the Volcanic Plateau which continues as a revisiting of my childhood haunts. The extraordinary geology of the volcanic plateau has always fascinated me. I also continued working with the Te Ao Marama theme through the familiar rolling landscapes of Northland and the Kaipara.  I tried to characterise my love and reverence for the sea, the land and the sky in these paintings. 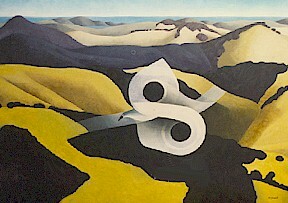 At Karekare, the spectacular uncompromising sheerness rising in great lumps from the sea; on the Kaipara, the shining silence of the light on the water which also evokes for me the imagery of McCahons "Tomorrow will be the same, but not as this is..". ... oh! the silence sank / Like music on my heart."